Joolwe.com is an online jewelry store that has a great selection of cubic zirconia earring, cubic zirconia rings, and name brand designer jewelry. Be sure to check out their jewelry blog too! Have you heard about Joolwe.com's NEW Free Jewelry Loyalty Reward Program?! No? Well let me share the good news with you! 2. Shop for the jewelry you want. Earn 1 reward point for each dollar spent. 3. Earn extra points for writing reviews and contributing to the Joolwe community. 4. After you've accumulated points for your free jewelry, find the piece(s) you'd like. 5. Elect to pay for your free jewelry with your points and add the item to your shopping bag. 6. Checkout and enjoy your jewelry! There are additional ways to earn points for free jewelry - please see the Free Jewelry Loyalty Reward Program page for more info! 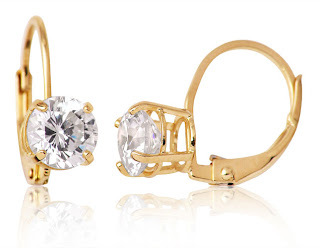 As part of spreading the word about the Free Jewelry Loyalty Reward Program, Joolwe.com wants to give away this gorgeous pair of Gold Over Sterling Silver and Round-Cut Cubic Zirconia Solitaire Leverback Earrings. One of my lucky readers will win the gorgeous pair of earrings above. For your required entry, please go to Joolwe.com and pick your favorite piece of jewelry, then come back here and tell me what it is. Disclaimer: I was not provided with a product for this post. For posting about the Loyalty Reward Program, I am receiving 30 Reward Points towards free jewelry, and you can too - if you blog about this program! I love everything at Joolwe and my favorite is the 10k Yellow Gold Diamond Embellished Heart and Love Pendant. Those earrings are really pretty. Thank you for this giveaway. I follow via Facebook Networked Blogs -Lee P.. I love the Sterling Silver Floral Round and Square-Cut Citrine Vintage Station Bracelet,perfect for me,my birthstone!! I like the 10k Yellow Gold Diamond and Embellished Heart and Love Pendant. Also I like the whole Elle line. I love the 10k Yellow Gold and 1.00 ctw Round-Cut Diamond S-Link Tennis Bracelet! I love the 14k white gold Multigemstone ring. It will go with everything! Great information. I will surely take a look at the site through the resources you provided in the post.